There are valid reasons behind this making a YouTube video unavailable. For example – copyright content, adult content etc. Video owners can create these restrictions or in some cases even the Government of a country can ask Google to restrict the videos and lastly Google itself can restrict any video. While these restrictions apply to a common man – they do not apply to tech savvy readers of this website. Let us go through how to bypass YouTube restrictions and watch YouTube videos not available in you country. There are quite a few ways to accomplish this. Easiest way is to use a proxy server. Using a proxy server hides the IP address of your location and hence, allows you to bypass the restrictions. 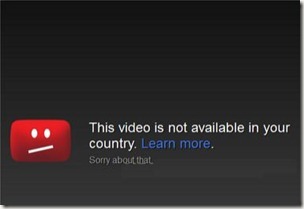 For example, if a YouTube video is restricted in India, you could simply use a proxy to set your IP address to a different country. A huge list of free proxy servers is available in another post of ours – how to watch vimeo and dailymotion in India . Use of proxy servers does pose a problem – many proxies are a bit slow, making them non-ideal in many cases for viewing video content. 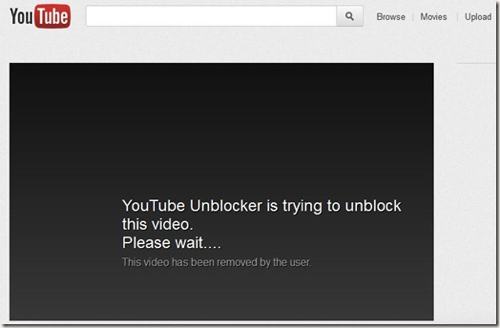 A better and simpler way to bypass some restricted YouTube content is to use a web browser add-on : YouTube Unblocker. Please note that you need to use Firefox for this purpose. The plugin automatically initializes when you visit a restricted video and attempts to bypass/unblock the video. In our testing, it was not found to be 100% perfect, but worked at least 90% of the time for all the videos and worked 100% of the time when trying to bypass YouTube country restrictions.